The Greek peninsula and Greek islands were characterized by conflict and instability during the Archaic Age, and this instability was the context for the emergence of Greek city-states. The territory of Greece is mountainous; as a result, ancient Greece consisted of many smaller regions, each with its own dialect, cultural peculiarities, and identity. Regionalism and regional conflicts were a prominent feature of ancient Greece. Cities tended to be located in valleys between mountains or on coastal plains and dominated the countryside around them. 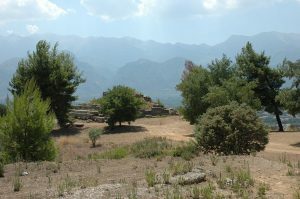 According to the legendary poet Homer, whose historical authenticity is debated, around 1200 BCE, the Mycenaeans were involved in a conflict with the city of Troy in Anatolia, called the Trojan war. 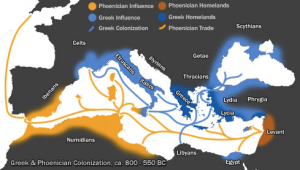 As Homer wrote in his famous work, the Iliad, at the same time as the war, various foreign “Sea Peoples” began invading Mycenaean settlements, prompting the inhabitants to migrate to islands in the Aegean, Anatolia, and Cyprus. At that time, writing seemed to have disappeared, and life in the Greek peninsula and Greek islands was characterized by conflict and instability. This instability was the context for the emergence of Greek city-states. Without a powerful, centralized state, smaller governing bodies created political order. One such type of governing body was the city-state or polis. Initially, the term polis referred to a fortified area or citadel which offered protection during times of war. Because of the relative safety these structures afforded, people flocked to them and set up communities and commercial centers. Over time, poleis—the plural of polis—became urban centers whose power and influence extended to the surrounding agricultural regions, which provided resources and paid taxes. By around 800 BCE, there were many poleis which functioned independently. In response to their own specific contexts, each city-state created a different form of governance, ranging from monarchies and oligarchies to militaristic societies and proto-democracies. Monarchies were sometimes ruled by a tyrant—a ruler who did not follow any set laws. Oligarchies were small groups of powerful individuals who ran city-state government. Oligarchs and tyrants often competed for power. Democracies were governments that allowed citizens to vote on and participate in making state decisions. Some of the most important city-states were Athens, Sparta, Thebes, Corinth, and Delphi. Of these, Athens and Sparta were the two most powerful city-states. Athens was a democracy and Sparta had two kings and an oligarchic system, but both were important in the development of Greek society and culture. Located in a fertile area of the Peloponnesus, a peninsula in southern Greece, Sparta’s population steadily grew between 800 and 600 BCE. As Sparta developed a complex and strong economy, it extended its power throughout the Peloponnesus and brought the people of neighboring villages under its control. The people in these villages, however, were not accorded equal status with Spartans. Instead, they became helots, who were a class of unfree laborers. Unlike enslaved people who were owned privately, helots were subjects of the Spartan state. They were able to have families and exercised some degree of freedom, but they were tied to the land and were required to supply Sparta with food. Spartans expended vast resources to develop a powerful and structured military apparatus to prevent and subdue rebellions. Though there was a very sharp distinction between Spartans and helots, Spartan society itself did not have a complex social hierarchy, at least in theory. Instead of wealth being a distinguishing marker, social status was determined by military achievements. Strength and discipline were emphasized, even in children at a very young age. At age seven, Spartan boys were separated from their families and sent to live in military barracks, where they underwent serious military training, leading up to active service when they were barely out of their teens. Though Spartan society did not have a rigid social hierarchy, it still had some influential groups. Like all Greek societies, Sparta was dominated by male citizens, and the most powerful of these came from a select group of families. The Spartan political system was unusual in that it had two hereditary kings from two separate families. These monarchs were particularly powerful when one of them led the army on campaign. The kings were also priests of Zeus, and they sat on the council of elders known as the gerousia, which was also the highest court in Sparta. There was also an executive committee of five ephors chosen by lot from the citizen body, able only to serve for a maximum of one year after which point they were ineligible for future office. Two of the ephors also accompanied one of the kings when on campaign. Just how these different political elements interacted is not known for certain, but clearly a degree of consensus was necessary for the state apparatus to function. Women in Sparta had more rights than women in other Greek city-states. In Sparta, they could own property, which they often gained through dowries and inheritances. Some women became rich when the men in their families were killed in war. In fact, women eventually controlled nearly half of Spartan land. In addition, Spartan women could move around with reasonable freedom, wear non-constricting clothing, enjoy athletics, and even drink wine. Athens emerged as the dominant economic power in Greece around the late sixth century BCE, its power and wealth was further bolstered by the discovery of silver in the neighboring mountains. Athens was at the center of an efficient trading system with other Greek city states. Trade was incredibly important for Athens, as it did not have the agricultural conditions to cultivate enough grain for its population. 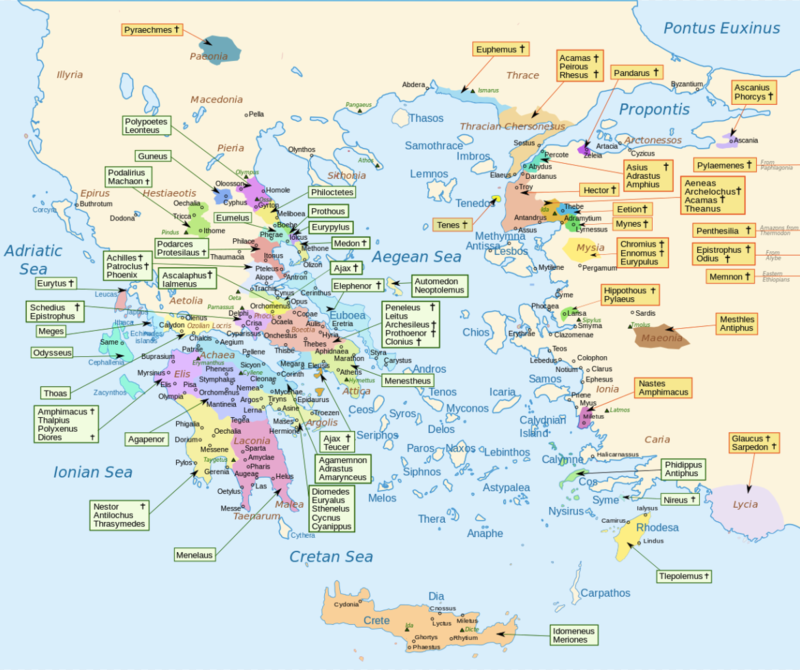 Athens transitioned through different systems of government as its population grew and became wealthier through maritime trade. This wealth became increasingly concentrated in the hands of a few members of the aristocracy, who were also political leaders, leaving other members of society in debt, sometimes to the point of being forced into debt slavery. Further, there was a perceived lack of consistency among the laws of the city. The first series of laws written to address these inequities was provided by the statesman Draco around 621 BCE, but the laws were considered too severe—the penalty for most infractions was death! This is where we get the term draconian! An aristocrat named Solon was called upon to modify and revise these harsh laws; he created a series of laws which equalized political power. Two of the changes for which Solon was responsible were the cancellation of debts and the abolition of debt slavery. He also created opportunities for some common people to participate in the government of Athens. In doing so, Solon laid the groundwork for democracy in Athens. Pericles led Athens between 461 and 429 BCE; he was an incredibly well-liked leader known for encouraging culture, philosophy, and science and for advocating for the common people. Under Pericles, Athens entered its golden age and great thinkers, writers, and artists flourished in the city. Herodotus—the “father of history”—lived and wrote in Athens. Socrates—the “father of philosophy”—taught in the marketplace. Hippocrates—“the father of medicine”—practiced there. The sculptor Phidias created his great works for the Parthenon on the Acropolis and the Temple of Zeus at Olympia. Democritus envisioned an atomic universe. Aeschylus, Euripides, Aristophanes, and Sophocles wrote their famous plays. 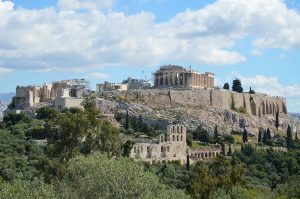 This legacy continued as, later, Plato founded his Academy outside the walls of Athens in 385 BCE and, even later, Aristotle’s Lyceum was founded in the city center. Still, Athenian democracy was limited to its male citizens. Foreigners, enslaved people, and women were excluded from these institutions. Women’s roles were largely confined to the private sphere, where they were responsible for raising children and managing the household, including enslaved people if the household could afford them. While women of the upper classes were often literate, most were not likely to receive an education beyond what was needed for the execution of their domestic duties. They required male chaperones to travel in public. Enslaved people, while not involved in political affairs, were integral to the Athenian economy. They cultivated food, worked large construction projects, and labored in mines and quarries. Enslaved people were present in most Athenian households, carrying out an array of domestic duties. Due to the increasing populations of the city states and the insufficient resources available, many Greeks began to look outward and create settlements outside of mainland Greece. Between the eighth and sixth centuries, hundreds of colonies were established on the coasts of the Mediterranean and Black seas. Later, Greek communities would settle in modern-day Sicily and southern Italy, even as far as modern-day southern France. Eventually, more Greeks lived in these settlements than on mainland Greece. Greek colonization invigorated the networks of trade and exchange throughout the Mediterranean. Greek language and culture spread throughout the region. However, it also brought conflict and tensions with the Persian empire, inaugurating the two-decade long Persian Wars from 500 to 479 BCE. As Persia consolidated its control over its conquests in Anatolia, Greek communities living in that area, called Ionia, resisted Persian rule. To support the Ionian Greeks, the Athenians sent their impressive fleet, which prompted retribution from the Persians. The ensuing conflict drew in other Greek city-states, most notably, Sparta. Conflict between the Greeks and Persians continued for over 100 years. Though the Greek city-states were unified to some extent in the face of an external threat, as that threat waned, conflicts between the city-states made a resurgence. 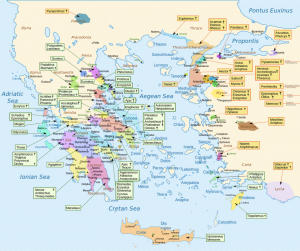 Following the wars, Athens emerged as the supreme naval power in Greece. It formed the Delian League, ostensibly to create a cohesive Greek network among city-states to ward off further Persian attacks. 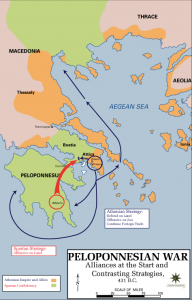 Under the leadership of Pericles, Athens grew so powerful that the Athenian Empire could effectively dictate the laws, customs, and trade of all her neighbors in Attica and the islands of the Aegean. The might of the Athenian Empire encouraged an arrogance in Athenian policy makers of the day which grew intolerable to the other city-states. When Athens sent troops to help Sparta put down a Helot rebellion, the Spartans refused the gesture and sent the Athenian force back home in dishonor, thus provoking the war which had long been brewing. Later, when Athens sent their fleet to help defend its ally Cocyra—Corfu—against a Corinthian invasion during the Battle of Sybota in 433 BCE, their action was interpreted by Sparta as aggression instead of assistance, as Corinth was an ally of Sparta. 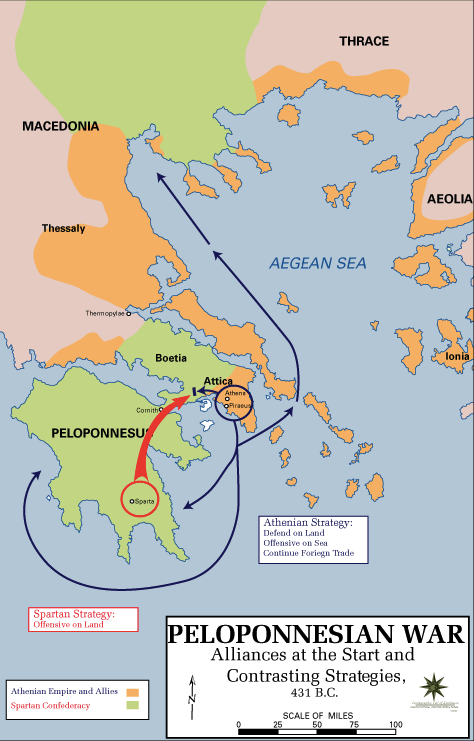 The Peloponnesian War—which took place between 431 and 404 BCE between Athens and Sparta, though it involved directly or indirectly all of Greece—ended in disaster for Athens when it was defeated. Its empire and wealth decimated, its walls destroyed, only Athen’s reputation as a great seat of learning and culture prevented the sack of the city and the enslavement of the populace.